IPVanish is a popular VPN service that boasts a larger server network and claims to deliver the “best VPN speeds” in the industry. Does IPVanish offer “top tier” speeds throughout the entire server network? Do IPVanish’s apps keep all data safe with a good kill switch, IP and DNS leak protection, and secure encryption? Does IPVanish provide stable connections without interruptions (good reliability)? All of these questions are clearly answered in the review below, with all tests results backed up by screenshots. First we’ll cover an overview explaining our findings, then dive into the detailed results. After conducting numerous speed tests with IPVanish servers in Europe, the US, and Canada, I concluded that IPVanish is one of the fastest VPNs I’ve tested. Nearby servers were always near my full baseline speed (over 90 Mbps). Long-distance server tests were likewise impressive, with excellent reliability and connection stability across the board. Security and privacy tests were also perfect. 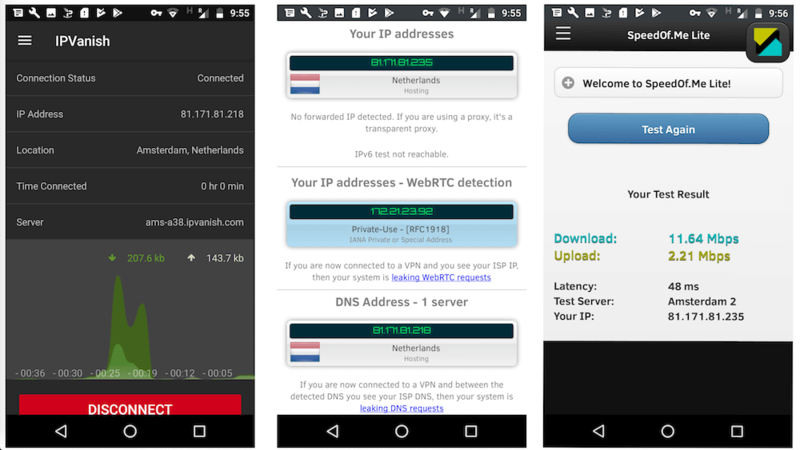 I did not find any IP address or DNS leaks with any of the IPVanish apps I tested on Windows, Mac OS, and Android. Everything worked perfectly, with data being secured via the OpenVPN protocol using AES 256-bit encryption. 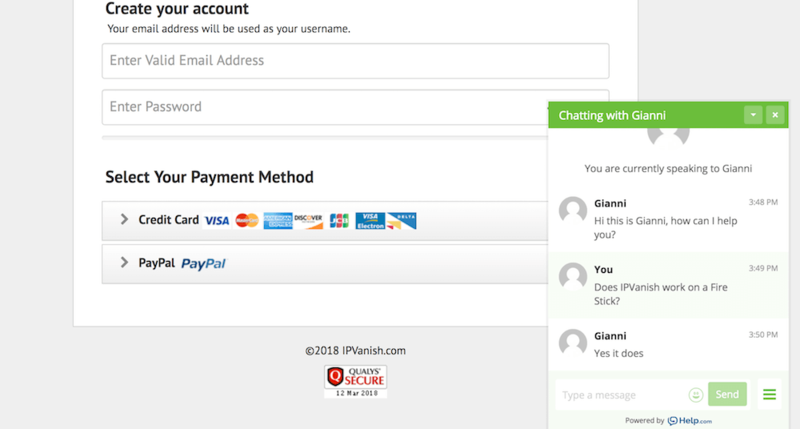 IPVanish has also lowered their prices with the 57% discount coupon while also increasing simultaneous connections allowed per account up to ten. Each subscription comes with a 7 day money-back guarantee. Lastly, IPVanish is one of the few VPNs in the world that owns every server in their network, which improves performance and security. The main drawback with IPVanish is that it is based in the United States, and the US is not the best privacy jurisdiction (due to mass surveillance). But because IPVanish has a zero logs policy, the US jurisdiction may not be concerning for most users. After all, no logs = no data. Despite this drawback, IPVanish is still a solid VPN that offers excellent performance and security, as you will see below with the test results. 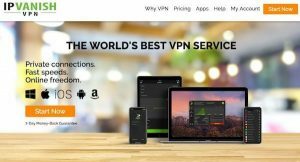 On its website IPVanish claims to offer the “best VPN speeds” through their “top tier” server network with locations around the world. I’ve been personally using/testing IPVanish since 2015 and it has generally been among the fastest VPNs I have used. So is 2019 any different with the latest round of tests? To find out, I tested numerous servers throughout the IPVanish network. My baseline (non-VPN) connection speed was about 100 Mbps connection and my physical testing location was Germany. Now let’s examine the results. This is indeed an excellent test result, nearly maxing out my baseline speed. So far, so good! So far these are amazing test results. The latency (ping) was excellent with every server, and download and upload speeds was near the full baseline. These are amazing results. I tested other servers throughout Europe and the results were also excellent. IPVanish offers consistently fast speeds on all nearby servers I tested, which nearly max out my baseline connection speed. Impressive! For the second round of IPVanish performance tests I went with servers in the US and Canada. And once again, the results were impressive. Given the longer distance between me and the NY server, I did not expect results this good. These are some of the best VPN speed test results I’ve seen, without any problems regarding speeds or connection stability. Overall, IPVanish does indeed provide the “best VPN speeds” with their network, exactly as they claim on their website. If you value performance with a VPN, IPVanish would be a solid choice based on these results. Not only were the speeds fast, but they were also consistent. This makes IPVanish a good choice for people who need a fast VPN for torrenting or people who want a VPN for Kodi streaming. Ok, now before we move onto the security/privacy test results, let’s first cover some basics about IPVanish, including the cost, apps, and subscription details. The cost of IPVanish is about average for high-quality VPNs that offer premium performance. It is slightly less expensive than ExpressVPN, but a bit more than NordVPN. With the regular prices, the cheapest you can get IPVanish for is $6.49/month with the annual plan. Fortunately, IPVanish is currently offering a nice 57% discount coupon, which saves you quite a bit on the standard prices. Note: This coupon only applies to the first billing cycle. Therefore the most savings will come through the annual plan. Payment methods – IPVanish accepts most major payment methods, including all large credit cards and also PayPal. Unfortunately, IPVanish does not support any cryptocurrency payment options at this time, although they have in the past. When I asked a customer service rep about this he explained the change was due to large fluctuations in the Bitcoin price and the high transaction fees, but they may be adding it again in the future. If you are less than 100% satisfied with IPVanish VPN service, we will gladly refund your payment as long as the refund is requested within one week from the date of the purchase. This is pretty clear cut and I did not see any issues or worrisome fine print. IPVanish provides a wide selection of applications for many devices and platforms. IPVanish offers apps for many devices. For this IPVanish review, I tested out their apps on Windows, Mac OS, and Android. IPVanish Windows app – The IPVanish Windows app did very well in testing. It is user-friendly, stable, and never froze up or crashed. IPVanish Mac OS – The IPVanish Mac OS app also did well in testing. This is an updated and improved version over IPVanish Mac OS apps I’ve tested in the past, which were a bit buggy. I did not notice any bugs or connections issues with the new Mac OS app. IPVanish Android – The IPVanish Android app performed well in testing without any issues to report. It has a good design and was stable in testing. We’ll take a closer look at the apps in the privacy/security tests below. IPVanish now allows 10 simultaneous connections with every subscription. The previous policy allowed five, but then in 2018 they doubled the number. This is well above average for the VPN industry (see for example with ExpressVPN at only 3 connections per subscription). 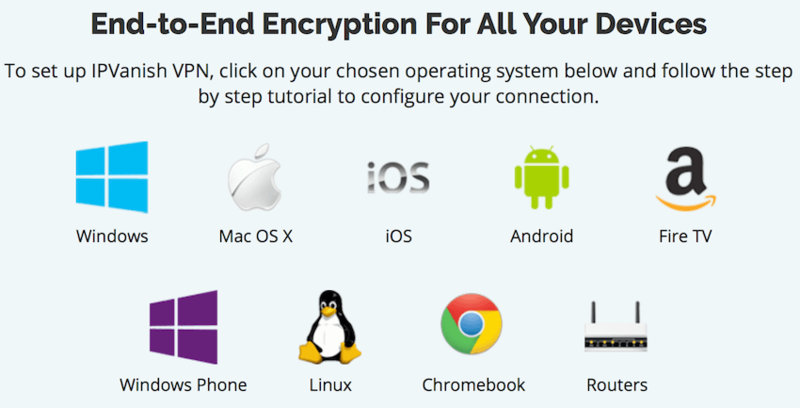 IPVanish uses the OpenVPN protocol with AES 256-bit encryption. This is the gold standard for VPNs and it is currently considered unbreakable. IPVanish performed well in all privacy and security tests for this review. I tested IPVanish for IP address leaks (both IPv4 and IPv6) and DNS leaks. IPVanish’s apps include good privacy and security features. Now we will move onto the test results. Windows app: Here is a test using the Windows app with a London, UK server. Everything passed with no issues whatsoever. No leaks were found when testing this IPVanish server in the UK. Mac OS app: Here are the test results with the Mac OS app using an IPVanish server in Amsterdam: no leaks, everything was working correctly. Everything checked out with the leak tests: no issues to report. As you can see in the results above, IPVanish passed all privacy and security tests without any leaks discovered. One unique benefit you get with IPVanish is access to a massive server network with locations spanning all around the world. IPVanish has one of the largest server networks in the VPN industry, and as we saw with the tests above, it provides users with peak performance. What good is a large server network? More servers generally means better speeds as there is more available bandwidth per user. This also helps you to select specific servers for different needs, whether you are looking for a nearby server in your area or another geographic location for accessing media. It also gives you more options for geo-spoofing your location, which may be useful when purchasing plane tickets. Top tier network – Another benefit with IPVanish is that they own and manage their entire server network. In other words, everything is completely under their control. This is what they mean when they refer to their business as “the world’s only Top Tier” VPN provider. Does IPVanish use virtual server locations? A “virtual server location” is when a server that is advertised as being in a certain location is not actually there. For example, I found that PureVPN has many servers are not actually in the advertised location, and they do not disclose this to their users. You can identify virtual server locations using ping tests to triangulate the exact location (see here). With IPVanish, I tested a number of different servers and they all checked out. It does not appear that IPVanish is using any virtual server locations. IPVanish is a zero logs VPN service as they explain on their website. But before getting into their exact logging policy, we’ll first examine a logging case that happened a few years ago. In 2016, when IPVanish was owned and operated by a different company, they cooperated with the FBI for a criminal case. In this specific case, they provided connection data to authorities, after the FBI made two separate requests during an investigation. While this is concerning from a privacy standpoint, especially since IPVanish has a no logs policy, it’s also important to note this happened when the company was under different ownership and management. IPVanish is now owned by StackPath, a company based in Dallas, Texas (USA). This logging case happened when IPVanish was owned/operated by HighWinds Network Group in 2016. The sale to StackPath took place in February 2017, after the logging case. Additionally, I also spoke to IPVanish staff about this case and they provided further assurances that this type of cooperation has not and will not happen with StackPath. What are IPVanish’s current logging policies? IPVanish is a zero-logs VPN service provider, which means that we do not keep a record of any connection, traffic, or activity data in regards to our Services. The only information that is collected during registration is an email address (for account purposes) and payment information for account renewal, refunds, etc. There are also a few VPN providers that have been verified in real test cases as VPNs with no logs. Some of these include ExpressVPN, NordVPN, VyprVPN, and others. For a direct comparison, see the ExpressVPN vs IPVanish guide. I tried phone support, just out of curiosity because I’ve never seen a VPN offer phone support. It went well – I was quickly connected to a guy named Blake, somewhere in the US, rather than an overseas call center in the Philippines. Blake was helpful. I did not have any technical issues or problems with the apps, so my support interactions were limited to general questions. The IPVanish website also contains some great guides and informational articles on various topics. These are all accessible from the knowledge base and in the member’s area. You should be able to get everything set up just using the guides in the member’s area. But if you have any problems then you can try chat support or just send them an email. I also downloaded and tested out the IPVanish Android app for this review. Overall it performed well without any issues to report. Here are a few screenshots I took, with the Android app on the left, leak test results in the middle (no leaks!) and a basic speed test on the right (slower speeds were due to the slow network I was on at the time, not the VPN). IPVanish’s Android app performed well in testing. Overall the IPVanish Android app seems to work fine. Connecting and switching servers was easy and I didn’t find any leaks or problems to report. If you want to use a VPN on your mobile devices (Android or iOS), IPVanish would be a good choice. IPVanish is also a good choice if you want to use a VPN on a router. This will secure (encrypt) your entire home network and all devices that connect to your router. Furthermore, it will only count as only one device when you use IPVanish on your router. But because IPVanish gives you 10 simultaneous connections, this probably is not an issue. A VPN router is a smart idea simply because most internet providers are now monitoring and recording your online activities. This is official policy in the United States, the UK, and now also Australia (see the best VPN services for Australia). Want to use IPVanish on a router? Check out the IPVanish router options here. No. IPVanish does not consistently work with Netflix. Unfortunately, all of the IPVanish servers I tried seem to be blocked by Netflix. However, there are occasionally reports of a server getting through. The support person I chatted with also confirmed IPVanish’s difficulty in accessing Netflix. When you try, you will get the annoying Netflix proxy error message. There are also some other options you can read about in the VPN Netflix guide, which has recently been updated and improved with the best (and worst) VPNs for Netflix. As you can see with all the test results, IPVanish performed very well for this review, even if it didn’t quite meet the criteria to be listed in the best VPN report. It remains an excellent VPN for those seeking the best performance in terms of speed and reliability, while also offering excellent encryption and security features. Value: Is IPVanish worth the price? While IPVanish is based in the United States, it is a zero logs VPN service with a strong commitment to user privacy under new leadership with StackPath. If you think it may be a fit for your needs, all plans come with a 7 day money-back guarantee, which gives you a risk-free out if it doesn’t meet your needs. If you have used IPVanish, feel free to share your honest review (good or bad) below. TERRIBLE vpn service. It does not work properly in the US. It is extremely slow and inefficient. The company will also continue to charge your credit card even after you have canceled your subscription. I also felt for the trap where I thought I was signing up for a 1 month subscription but realized several months later that they kept charging me. IPVanish is a big no no. Cancelled my service over a year ago and just discovered that IPvanish was charging me all that time. I called them. They said the service was cancelled when I wanted it to be cancelled but was reinstated later. They dont know who and why reinstated it but they are not going to refund me my money. There are a number of decent VPN services out there. Stay away from ipvansh. Interesting Kevin, I’ll have to verify that and update the review accordingly. Thank you. IPVanish does everything I need it to for basic browsing and torrenting: fast speeds, no leaks, no logs. Done deal. I’m using it on Windows and an iPhone. So far so good. I would strongly recommend, but I don’t want it getting too popular with more users on the network. I’d like to keep these speeds, ha! Time for an updated review? I have used IPVanish for a about 48 hours, after which I abruptly cancelled. Their money back guarantee was very good. Unfortunately, their service was subpar. With the exception of all but a couple (no exaggeration) of world servers, performance was dismil at best with about 60-70 performance hit. The other thing was their Android app which did not play nice on some Android devices including tv boxes. Worst of all, Google was very well aware I was using a VPN as did some other countries, sites. I have not tested all the VPN providers out there, I have tested many though. So far, Express VPN seems to be the most stable, offer servers with the optimal throughput, offer the least performance hit. 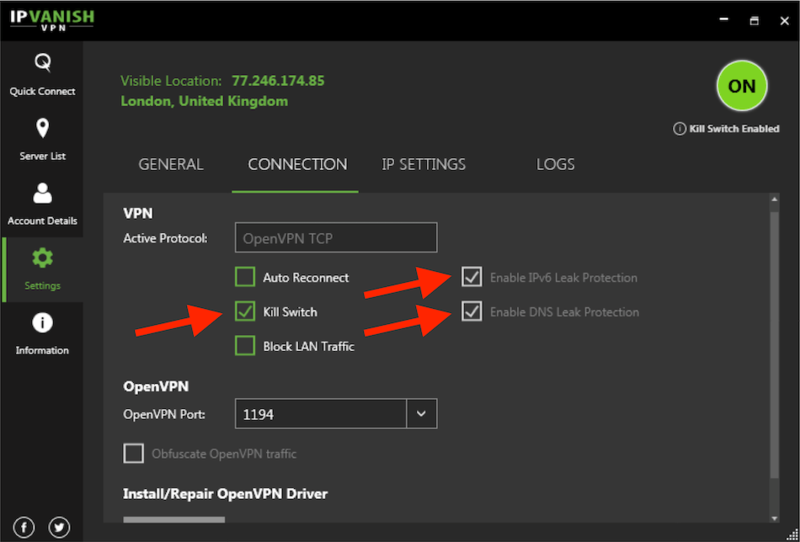 I am from the UK and they have 2 Glasgow server and this means less legacy and whats more they are the only VPN provider that has this. I have contact the top three and I was shocked they said to me it’s not about the number of servers they told me and then said it also has to consider the VPN latency speed also. They said their server was fast. I was shocked how none of the vpn has any in Glasgow with the closed is London which is miles away in the other side of the country.